Within the first year of an infant’s life, she goes from not being able to roll at birth, to walking independently just 12 months later. 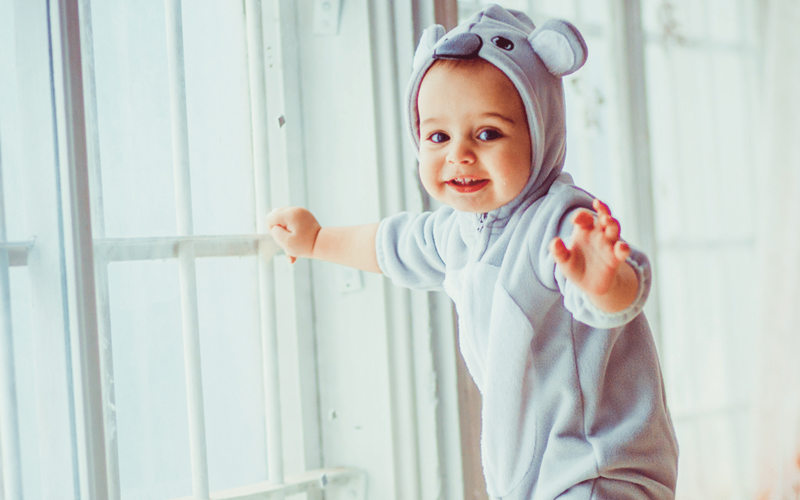 Paediatric neurologist Dr Amith Keshave explains how these gross and fine motor skills develop over your baby’s first year. In the first 12 months of life, your baby’s brain develops rapidly. During this time, the main area of growth and development occurs in your baby’s motor skills. This exceptional leap in development occurs because of the interaction your baby has with her environment and the development of the motor pathways in the brain, which run from the brain to the individual muscles in her arms and legs. As the brain learns to control muscle movement, it learns to interpret signals that are sent from the muscles and tendons back to the brain. This allows the brain to identify where the limbs are, spatially, and the exact position they are in at any particular moment. This, in turn, enables your baby to learn how to make definitive, precise movements. When you were first learning to ride a bicycle, you had to concentrate hard on trying to pedal while simultaneously trying to balance. This involved many falls along the way. However, once you mastered the skill of riding a bicycle, it became automatic and you could then move on to more challenging skills on the bicycle. Similarly, your baby needs to learn how to control her muscles, which includes controlling the power of her muscles, her balance, and proprioception (your baby’s sense of her body’s physical position and the space around her). This explains why your baby will learn to roll, then sit, and then progress to pulling herself up to stand, until eventually she’s mastered the art of walking. These skills involve motor centres in the frontal lobe of the brain, sensation from the parietal lobe, vision from the occipital lobe, and balance from the cerebellum. So, as your baby tries to master motor skills, her brain develops in many ways. 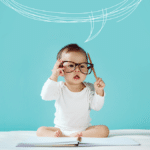 When will your baby start to develop gross and fine motor skills? Gross motor skills develop from day one as your baby learns that she is no longer existing in a liquid medium in mom’s womb. She will move her hands and feet in response to touch and sound. If she is born at full term, she should also be able to hold her head up to 45 degrees when lying down. You baby will start to try to lift her head off the bed while lying on her tummy. By this stage, she will be able to control her head up to 90 degrees, when being pulled into sitting position. When supported in a sitting position, your baby will able to maintain good head control. At this stage your baby should be able to roll, bear weight on her legs if supported, and lift her head and shoulder off the surface while lying on her tummy. By four months, there shouldn’t be any ‘head lag’ on pulling her arms up to sit. 6 months Your baby will be able to sit without any support. Your baby will start standing with support by holding onto something. By this stage your baby will start pulling themselves up from a seated position to stand. She should also be able to get into a seated position from lying down. When your baby has reached the 11-month mark, she should be able to stand alone for about two seconds. A toddler should be able to walk independently by 14 to 15 months old. Fine motor skills require intact visual pathways so that a child can identify that their hands and feet are indeed their own. Once your baby has identified that she has hands and feet, she will learn to explore with them, and this is how fine motor skills are developed. She will be able to follow an object with her eyes until the midline (an imaginary line from the head to the toe that separates the left and right halves of the body). Your baby learns to track things visually past the midline. She starts to realise that she can control her head, and turn it to follow an object that passes the midline. At three months, she will learn to clasp her hands together and bring this to the midline or her mouth. She learns to grasp items, such as holding a rattle. This important realisation – that she can now manipulate objects she sees – allows her to explore more. Initially, the grasp is a palmer grasp. This means that the object is held in the palm, with fingers curled around it. She begins to reach for objects of interest. When she is able to sit without support, your baby will be able to reach for objects presented, as well as pass objects on. At this stage, she has only developed single object permanence. Object permanence is the understanding that objects exist even when we aren’t able to see, hear or touch them. Having only single object permanence means that your baby is only able to focus on one object at a time. So, if she is holding an object in one hand and is given a second in the other, she will drop the initial object for the new one. Your baby will be able to hold two objects in her hand and single object permanence disappears. A pincer grasp will have been established. This is the ability to pick up objects between the thumb and index finger. You baby will be able to hold a cube in each hand and bang them together. She has now realised that she is not only able to hold the object she wants, but she is also able to manipulate it. She is able to place a cube in a cup, indicating that she is now starting to gain better control of objects. She is also able to hold a pen with a weak pen grip and strong palm grip for scribbling. This is also the time when she is able to mobilise by walking: it’s a potentially dangerous combination to be able to scribble and walk. The best way to stimulate your baby’s motor skills is by allowing them to play with toys, bright objects, balls and blocks. Tummy time is also important in the developing of gross and fine motor skills as it helps to strengthen the back, shoulders as well as the arm muscles, so make sure that you set aside some time every day for your baby to spend on her tummy. Don’t worry if your baby‘s fine and gross motor skills milestones are delayed by a few months, but she is otherwise healthy and happy. Babies develop at their own pace. However, if you feel that your baby is not reaching her motor milestones despite concerted efforts by the family, it is best to have your child assessed by a medical professional.